Course descriptions provide brief descriptions of kindergarten, elementary, middle level and high school curricular areas. These descriptions will assist schools in communicating, in a broad context, the content of programs and courses. Code numbers listed before each program/course title and description are to be used for Indiana Department of Education data reporting. The table below provides access to the 2019-2020 Course Titles and Descriptions for high school curricular areas. 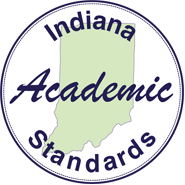 As of December 12, 2018, the Indiana High School Course Titles and Description documents were approved by the Indiana State Board of Education. In November 2011, the State Board of Education approved the inclusion of a "Quantitative Reasoning" requirement to all diploma types, among other changes. A quantitative reasoning course is a high school course that advances a student's ability to apply mathematics in real-world situations and contexts and deepens a student's understanding of high school mathematics standards. View a list of the approved Quantitative Reasoning courses. The list of courses above have been approved for general use by the State Board of Education. In addition, schools can submit a nonstandard course waiver to offer courses that are not found in the documentation above. Schools must have an approved nonstandard course waiver prior to offering a course or awarding credit for a course that is not in the state approved course titles and descriptions document. To apply for a nonstandard course waiver, please complete the waiver document below. Please submit your request to the appropriate department for approval.